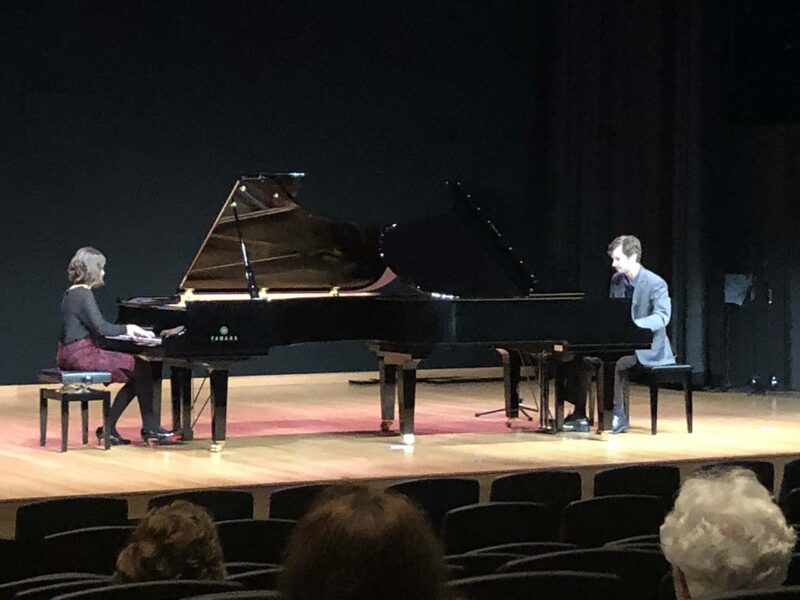 The National Composer Commissioning Program supported by MTNA through the affiliated state associations is designed to encourage the creation of new works by American composers. The Indiana MTA board commissions a composition annually that receives its premiere performance at the state conference. 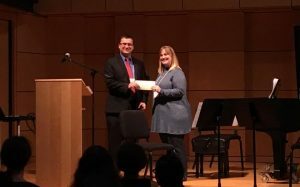 The selected composer receives a $5,000 award. For more information or questions regarding the program, please contact the IMTA board’s MTNA Composer Commissioning chair, Caroline KyungA Ahn. 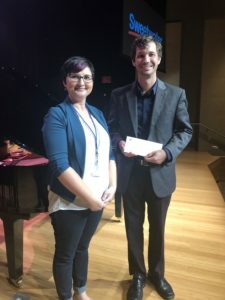 IMTA State President Amy Chaplin presenting 2018 Commissioned Composer, Benjamin Krause, with the commissioning check. This program is sponsored jointly between MTNA and IMTA. This is a joint commission from IMTA/MTNA. The piece will be entered into the MTNA national competition for Distinguished Composer of the Year ($5,000 prize). The current commission amount is $1500 ($750 provided by IMTA; $750 matched by MTNA) and will include a Form 1099. The premier must be at the IMTA state conference, with the completion of the piece at least 4 weeks prior. It is the composer’s responsibility to provide performers for the premiere at the state conference, and also at the national conference if the piece wins the Distinguished Composer of the Year award. It is the composer’s responsibility to provide 4 scores and 4 recordings to the IMTA commissioning chair for submission to MTNA by Dec. 1 following the premiere performance. The complete MTNA guidelines are on the MTNA website. Copyright and future publication rights all remain with the composer. If you would like to nominate someone (or yourself) for the MTNA/IMTA Commissioned Composer program, please fill out the form below. Application deadline is December 1 of each calendar year. Nominations are not limited in any way. The candidate selected to be the Commissioned Composer will be notified in January by the IMTA Commissioned Composer chair. You may include up to 3 links to videos/websites/files highlighting examples of your work.